Aren't books the best gifts? I love receiving books as gifts, whether it be a book I've been dying to read or a book that someone else loved and wanted to share. I especially love gifting books to my friends and family. My nieces have always received books from me as gifts since they were little, and I love that I was a part of instilling that love of reading in them. I hope to do the same with my own kiddos. 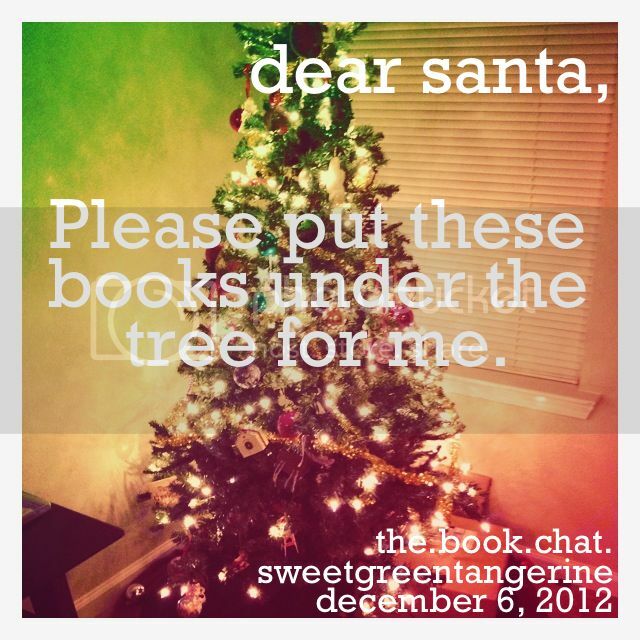 For the book chat this week, I want to see what books you want under the tree this year. What is on your Christmas wish list? 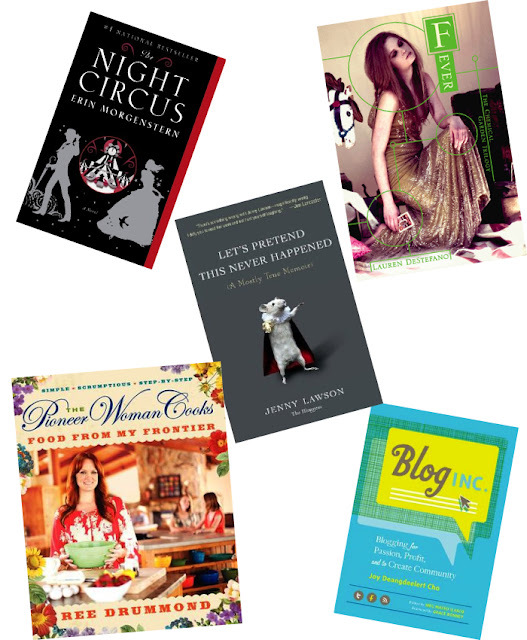 The Night Circus // Fever // Let's Pretend This Never Happened // The Pioneer Woman Cooks // Blog Inc. Yes, I already read The Night Circus, but I borrowed it from the library, and I miss it terribly. I find myself constantly wanting to pick it up and return to that fictional world I loved so much. Fever is the sequel to Wither which I received in the Book Swap. I can't wait to read on in this series. This was a big year for bloggers! I'm all for supporting published bloggers. I forgot this one on the list, but I want it too. And I think my husband should want me to have that Pioneer Woman cookbook as much as I want it. 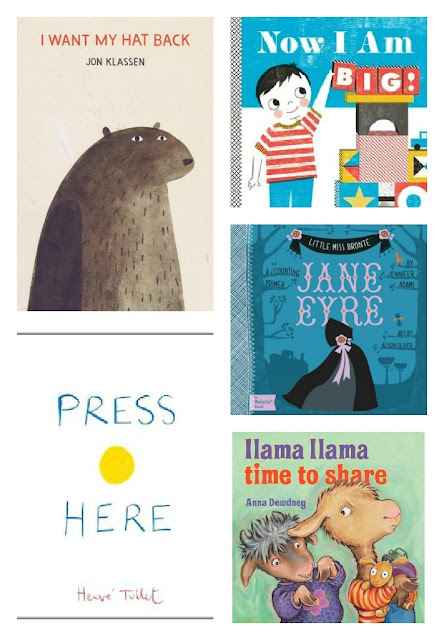 I also picked out a few children's books that I'm loving this year. If I were made of money, my kids would be getting them all. I know a certain little toddler who is getting that bottom right book under the tree this year. This is one gift he is receiving because of being naughty instead of nice. And have you seen these Baby Lit books? Little counting board books based off of classic novels. They have P&P, Jane Eyre & Romeo and Juliet. I can't even handle how cute these are. Also that Press Here book is awesome for those little kiddos that can't sit still through books quite yet. This one is very interactive. Can't wait to read those wish lists! Next week: Book Confessions. This was a little blog meme going around a couple months ago. I never had a chance to do one, so now's the time. You can see an example of one of these posts: here. Basically, we'll be confessing to all of those nerdy book loving things we do. I love the baby Lit books! I've never seen them before! What a cool idea. I'm interested in reading The Night Circus now. I have a reading list so long it's ridiculous lol. I need a vacation weekend somewhere tropical with just me, the beach, and books. Oh, man, books used to be the BEST thing to have under my tree on Christmas. One of my favorite Christmas pictures is of me excitedly holding up a set of three Baby-Sitters Club books. Now I'm much more of a library/Kindle person so I don't really ask for specific books but you've got some great ones on your list! I just bought 3 of the BabyLit books! I have never seen those before but they are so cute! I'm almost finished with The Night Circus and I love it! My husband likes when I cook from PW's cookbook but only the fried things! OHH you know what books I really want. I want more coffee table books! Books with travel destinations and tips, books about Harry Potter, art, photography... Those kinds of things! ooooh I totally forgot about Young House Love's book! I want it so bad!